I see we are expecting some snow this weekend. It doesn't seem to impact my visitors much though. The old regulars are always around. all enjoy their feasts at the feeders. took up flying to reach it from a tree! I haven't seen my little wren for a while now. I haven't seen him since. Which is okay by me. So aggressive! when the weather warmed up like today. 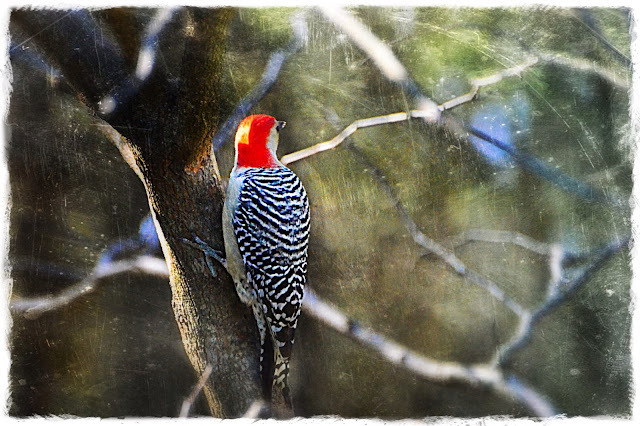 is my male Red-bellied Woodpecker. Here's a shot of him below from last winter. You may recall the hawk attack on him that I broke up. His mate comes every morning and feeds. Reminding me how fragile life is. And how brief it can be. I miss that feathered friend. My squirrels have become quite proficient at flying through the air to land on a feeder. Little buggers!!! They eat me out of house and home nearly. But, they do provide much amusement, too. thought you were going to sing for me. enjoy your weekend. Such colourful birds and such great photos of them all. 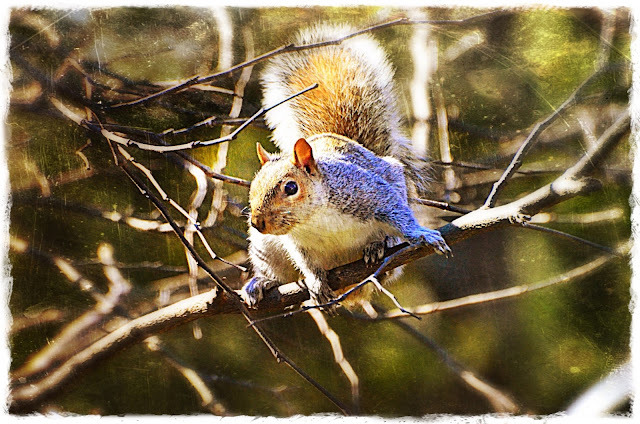 Such lovely birds, cute squirrels and beautiful captures, Reena! It is always sad to loose one of our animal/bird friends! I know I miss the ones I have lost! Have a lovely weekend -- hopefully with more of the beautiful weather!! Reena, what a great post. You know I love all the birds. I hope you have new Redbellied show up to keep the female company. Wonderful photos. I love your feathered friend photos. 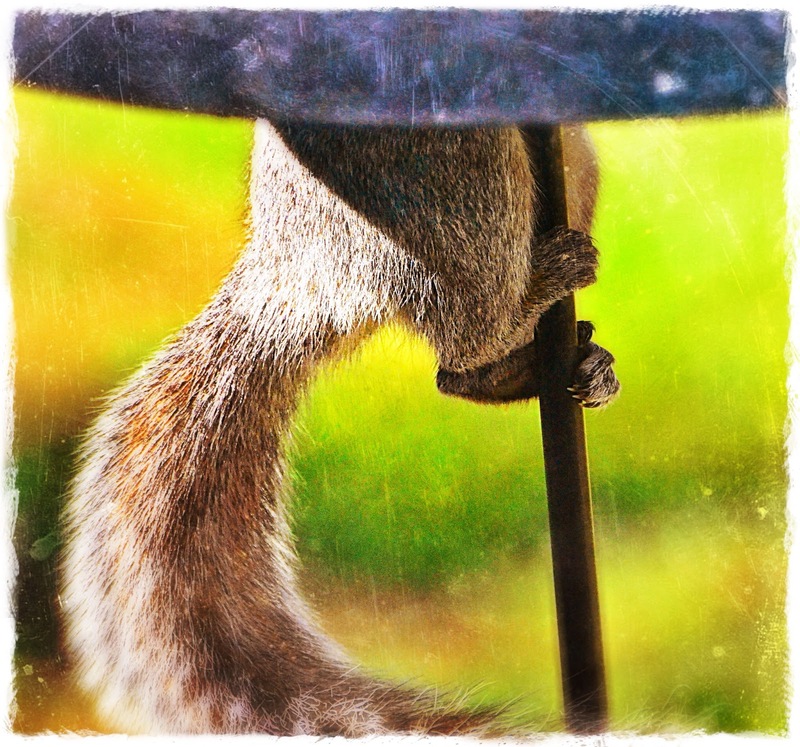 Not sure what's going on here in Ohio but this is the first place I've not seen a squirrel at our bird feeders. Guess they must have enough food of their own! Our dog Ravyn killed a cardinal the other day, it broke my heart when I saw it in her mouth. Love your photo edits! But even without them, your pics are clear, concise and beautiful! Wishing you a most wonderful weekend! What beautiful bird shots - nice to see them eating their fill. Lovely amount of birds, and the squirrel and beautiful chipmunk, I love them. A shame about the hawk attack, but nature can seem cruel to us. Beautifully executed photos from composition to edits! Que sera, sera is right. Great post Reena! Love them all! what a change , we had snow and plan on more cold. Beautiful captures! 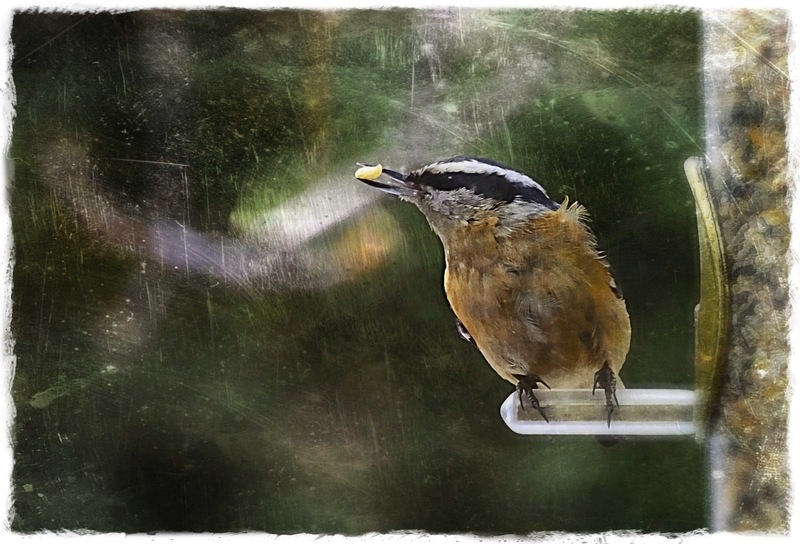 I noticed the birds singing loudly today - particularly the Titmouse. My mother actually got mad at me yesterday because she saw me looking out the window at a squirrel who was raiding one of her bird feeders and I didn't hoop and holler and bang on the window to try to scare him away. Those little squirrel feet are precious! You have an amazing menagerie there! It's funny how we come to take our regular visitors for granted sometimes, forgetting their presence might be a once in a lifetime blessing, a crossing of our journeys. These are beautiful, Reena. I especially love your little pole dancer!! I hope you're having a great weekend! No way that I shall miss all these little critters. Hi Reena~beautiful photos! You have many great visitors. Sorry to hear of the fate of your Red-bellied! The squirrel photos are too funny! They are very determined creatures! 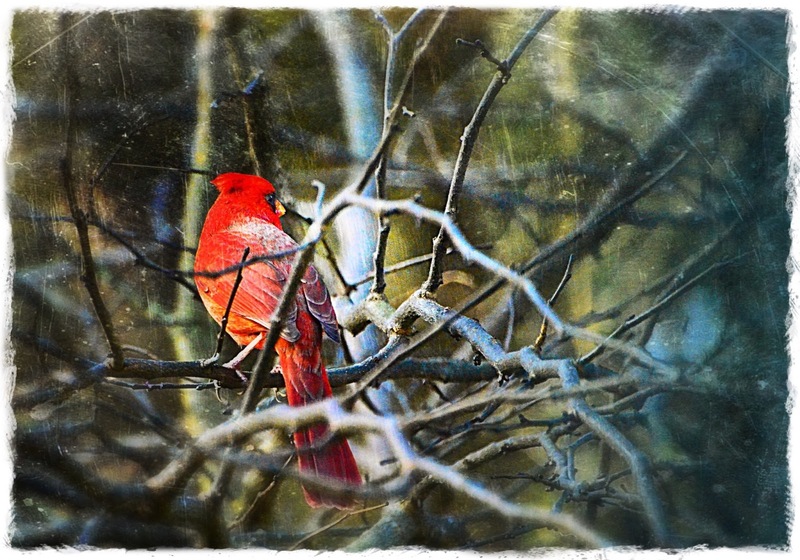 Great photos of the critters and birds you get to watch at your place. What characters the squirrels are. I watch them out my window and their antics make me laugh out loud sometimes. I enjoy looking at your pictures. You have the sweetest little feathered friends, the chipmunks are pretty cute too. I know what you mean about life being fragile, I had a similar situation with a baby Butcher bird and a Peregrine Falcon, was so distressing, the parents were going frantic to chase him off, to no avail..tough out there! Signs of real spring! And here - we are having lots and lots of winter! Some wonderful shots here, Reena. Our chippers tend to stay hidden until there are a number of mild days.. and they happen with more frequency. I wouldn't worry overly much. 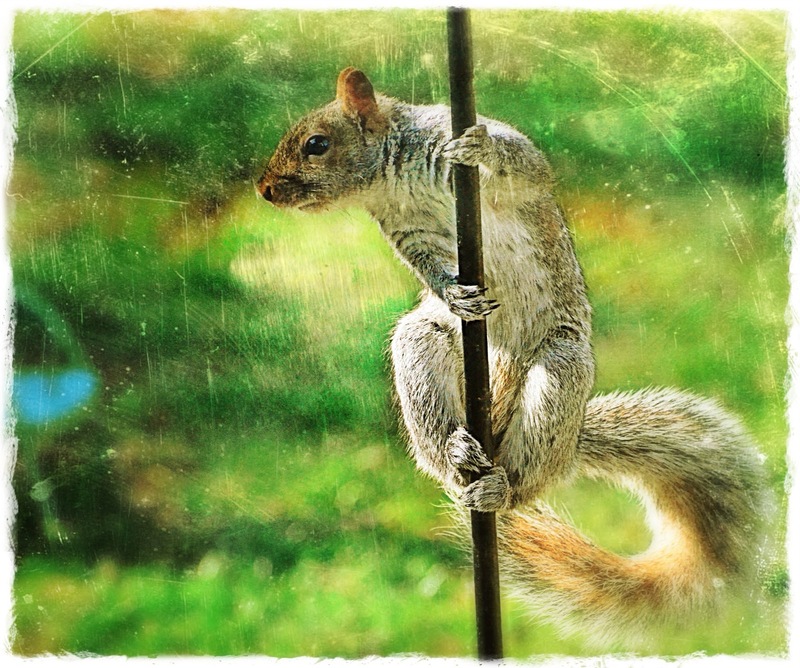 The squirrel on the pole shot is a hoot. catch up Monday ... it fa-reezing here ... i love the layer/effect on these ... what did you use? each one sweet but different. Ha! Squirrels rarely give up. 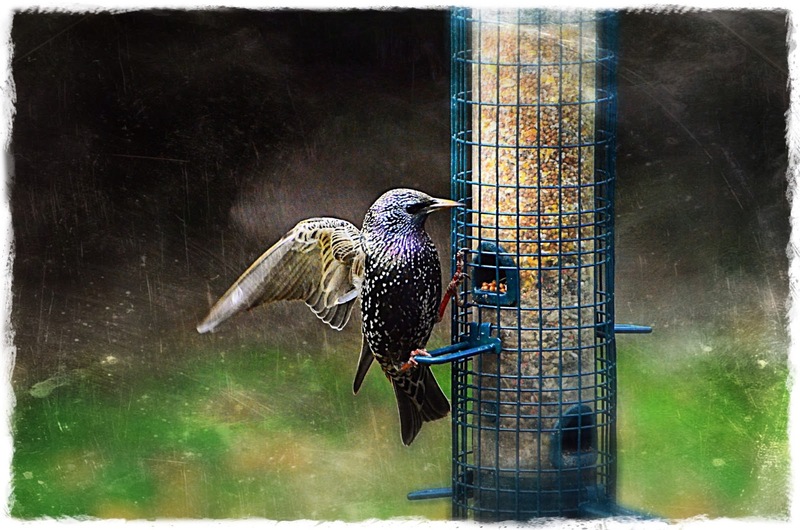 You have lovely birds visiting your feeder! Such cute and sweet sights to fill you daily with a dose of nature. 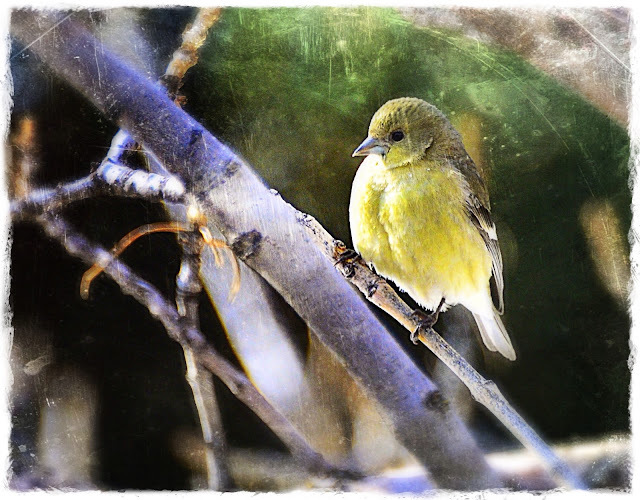 Beautiful captures and editing Reena!